When migrating data and workloads to the Amazon Web Services (AWS) cloud, we simplify our methodology so you can follow along the journey and understand the process from start to finish. We take time out during the process to answer any questions you may have so you can feel confident that the solutions we provide are secure, optimized, and highly scalable while minimizing your operating costs in comparison to your previous on-premise solution. By shifting to the AWS cloud, companies can bring up new virtual servers in a matter of minutes, resulting in shorter downtimes, rapid deployments, improved on-demand handling, and more successful short-lived but resource intensive projects. Considering migrating your workloads to the AWS cloud? Contact us today. We will be happy to provide a solution that works for you. In this example, we leverage the services provided by Amazon Web Services (AWS) to migrate all the existing workload from an on-premise facility to Amazon Web Services. We can migrate the virtual machines from on-premise to AWS in a number of ways using AWS snowball, AWS Direct Connect, AWS CLI or via the internet. Virtual servers and data migrated from an on-premise facility are stored in AWS S3. These are then exported from S3 to AWS AMI and EBS snapshots. 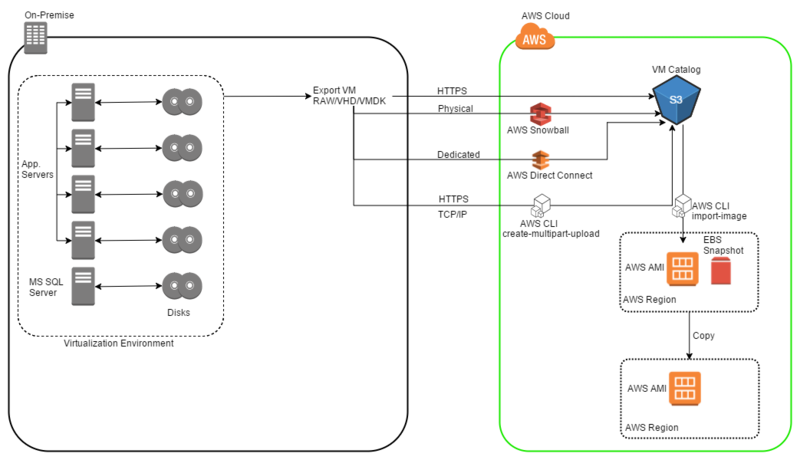 When needed AWS EC2 instances can be spun up from these AMIs and EBS volumes can be created from EBS snapshots.